A week without posts, how terrible am I? Problem is, all the things I’m working on now are secret projects, so I feel like I have nothing to talk about. I don’t know how other designers do it—keep their designing projects quiet and still have plenty of other things to talk about. I’ve been eating, drinking, sleeping this design all week so I’ve got nothin’. Except the cats. Here, have one. 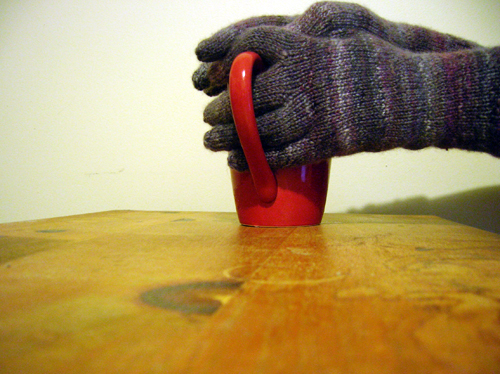 Trying to photograph one’s own hands is a challenge unto itself, especially when one’s gloves are still slightly damp. I can’t say these are the best things ever; I had to rush through them and it shows—they would’ve been amazing with a bit more planning. As it is they’re certainly serviceable (and soft! holy cow are they soft), and a great learning experience on 1) how to knit gloves and 2) why I shouldn’t procrastinate. 1. 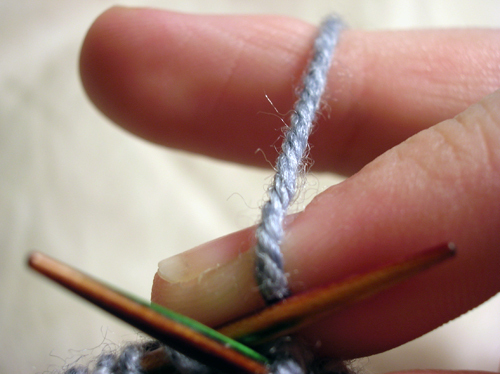 Fingers take longer to knit than I think they will. 1a. Thus, gloves are not, in fact, faster than socks. 2. Using a provisional cast on every time I needed to cast on at finger joins and pick up stitches in that area later was brilliant, and a trick that I will definitely use again. 2a. 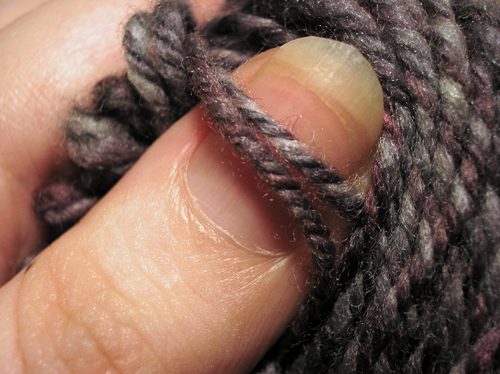 This trick tends to pull said joins up higher than they would normally sit otherwise, so I should knit the hand shorter and the fingers longer accordingly, next time. 2b. I have really small hands and really long fingers. (I’ve been told this for years, but it’s finally managed to sink in. 3. I have some (comparatively) tiny wrists that come to their narrowest just before my hand starts widening. 3a. I should, therefore, decrease at that point just a smidge to prevent a bunch of floppy fabric from bunching there. 4. Dude, if you’re doing something on a deadline, and that deadline is fast approaching, you literally cannot do it later. There is no room for deferring. 4a. That didn’t stop me from procrastinating at every turn and even taking entire days off in the middle of the Ravelympics to work on other things, or sometimes even do nothing at all. 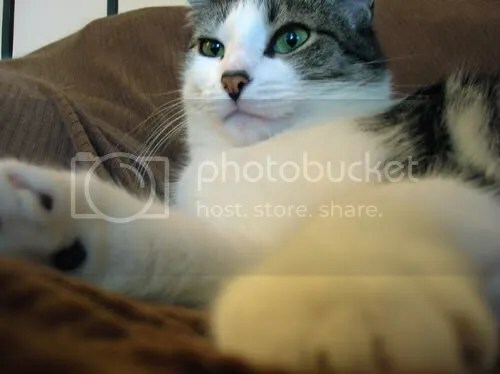 Kitty is unimpressed. But what else is new? 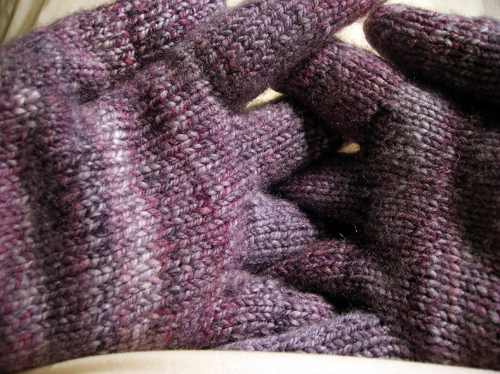 My original plan for my Ravelympic yarn was to knit socks, but due to various factors (yarn is too thick, not enough time, and I don’t want to shove all that soft and smooshy goodness into my shoes), I’ve decided to switch to… gloves. All of a sudden I have the strangest urge to knit huge amounts of winter accessories, like neckwarmers and gloves and mittens and scarves and maybe some hats. I don’t know why; although it’s been cooler than usual here it still hits 30C/85F most days. Still, my birthday’s only a few weeks off, which means fall (glorious fall) is also on the way. I did have to frog my Smooshy sock. The pattern, while gorgeous, had some weird fiddly bits that I think could’ve stood to be re-worked/better written. I might return to them eventually, but not with this yarn—the fantastic erqsome has already promised me a pattern to use for the Smooshy. 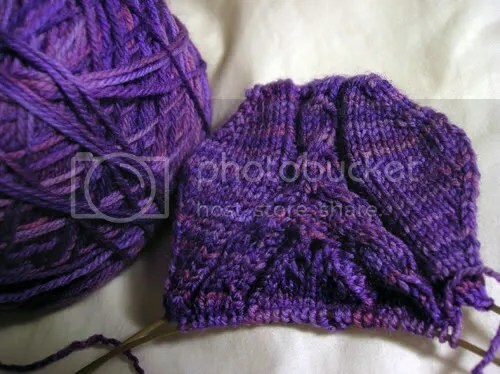 But, since I seem incapable of having my US1.5s empty for more than five minutes, I had to cast on for something new. That’s right, folks! After an extremely intense plying session in which I managed to break both my only bobbin and my brake band (solved with fast drying elmer’s glue and some nylon beading wire, respectively), I have finished my Ravelympic yarn. I can’t even begin to describe how soft and squishy this stuff is. 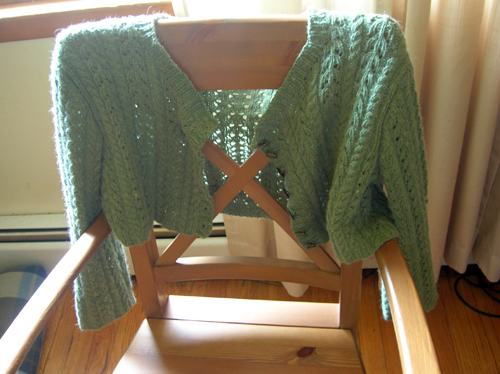 I’m almost tempted to leave it unknitted for a while so that I can just show the yarn off to everyone I meet. I wonder if my mailman would like to squeeze my skein. Seriously though, I’ve got this sitting on one side of me and a ball of DIC Smooshy on my other side, and guess which is softer and squooshier? That’s right. 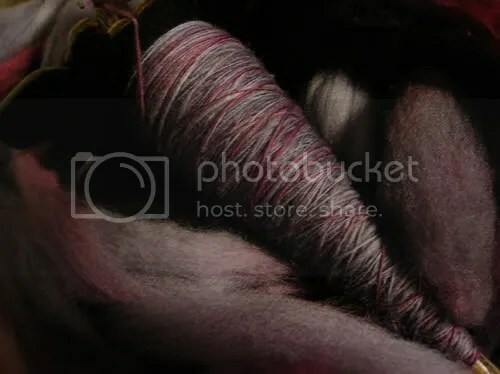 My yarn. 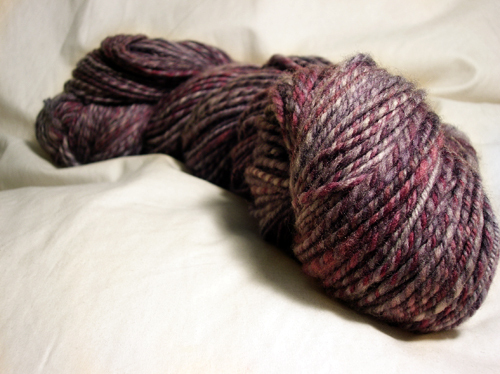 My very own handspun yarn. I accomplished the super-squooshyness by underspinning my singles (to the point where I was concerned that they would fall apart in some places) and then over-plying them so that all the extra bounce would be trapped in the ply. And it worked splendidly, if I do say so myself. On the whole I think it’s obvious that I still have a lot to learn, but at this point I think I’m generally happy with the yarn that I’m turning out, even if it’s not yet quite as even and consistent as I’d like it to be. Started: 3.9 oz of rambouillet from Flawful Fibers in bloodstone. Finished: 310 yds of 15wpi 3-ply, spindle spun and wheel plied. I finally get the chance to make my big FO post and I’m at a loss for words. Notes: Any changes I made this time around were fairly minor; some gauge fussing mostly, and short-rowing both the sleeve cap and the shoulder shaping to make for easier seaming. There are a few things I wish I had changed, though, and if I make the full size version at some point I probably will make these modifications. 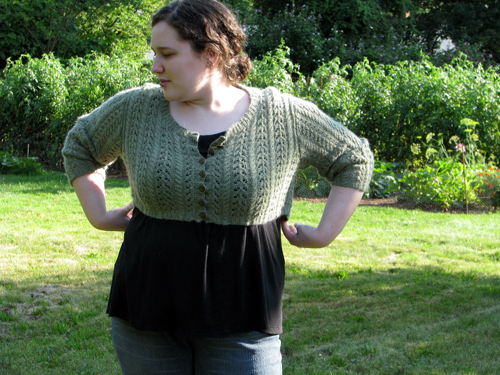 First, there is absolutely no waist shaping in the cardigan, which I thought I could get away with since I was knitting the short version. Considering the 8″ difference between my ribcage and bust measurements, I probably should’ve cast on fewer stitches and increased up to my size. I might weave some elastic into the ribbing to get it to pull in a bit more, on this version. 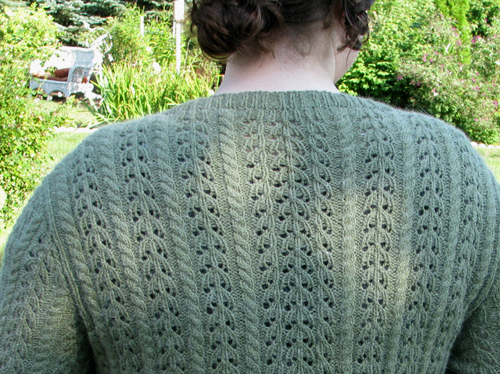 The only other major change I’d make would probably be to reorganize the pattern on the back, a bit; the way it is written, the five stitch motif that appears on the rest of the sweater is surrounded by an extra four stitches on each side. I’m not really into the way this breaks up the flow of the pattern, and I would move those extra stitches to the far sides of the back. Most of you were spot-on, although I happen to know that several of you totally cheated by noticing that I mentioned it on my Plurk page. But that was mostly my own fault, since I’d forgotten that I had done the mentioning. Oh well. By virtue of being correct and getting lucky with the random number generator, illiane snags the prize, which is a secret, so I’m not saying any more until she gets it. 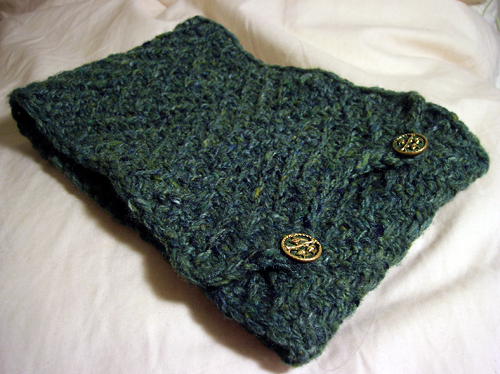 Notes: I had an overwhelming urge to knit a herringbone neckwarmer for three reasons: one, instant gratification! two, neckwarmers=an awesome way to show off really neat buttons, and three, in case you haven’t noticed, I really love herringbone. 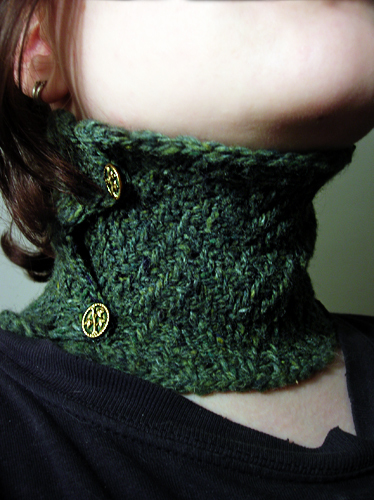 3a, neckwarmers in August are a really excellent idea. No really. Stop looking at me like that. So I cast on 28 stitches (the stitch pattern technically calls for a multiple of 4+2 but I wasn’t really paying much attention and it doesn’t matter too terribly much) and worked in transverse herringbone (which is from one of the Barbara Walker dictionaries, but can also be found here) for about 14″. The stitch pattern is extremely dense, with slipped stitches on every row, which is why I used such a large needle size for the yarn—otherwise I would have a bulletproof neckwarmer, which, while probably wind-resistant, would be a bit much for New Jersey weather. After I bound off I realized that not only were the edges horrendous looking, I’d also forgotten to include buttonholes, which are kind of useful sometimes. So I solved both problems at once by doing one row of single crochet around the whole thing, throwing in two ch 2 button loops on one end. The buttons themselves were snagged from the Traveling Button Box Swap from the Button Addicts group on Ravelry. I placed them in about a half an inch from the edge, which leaves enough of an overlap so that none of my neck is exposed, but also enough ease (about 1.5″) so that I won’t appear on the news for being strangled to death by my own neckwarmer. There’s a Rav page for this project here, which doesn’t really have any further information, but does have a handy favouriting button, just in case you feel so inclined. But instead I find myself reaching for this. 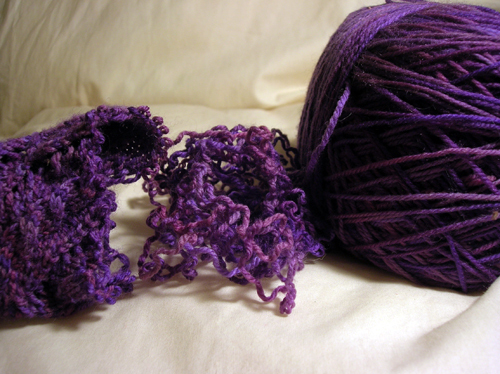 And even… casting on, knitting, and finishing an entirely unrelated new project in 24 hours. So in lieu of something actually exciting, let’s have a bit of a contest, shall we? 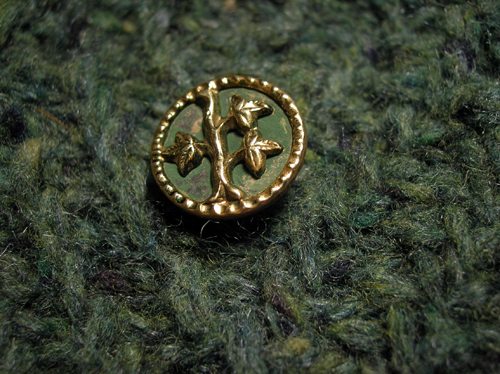 If you can guess what the object in the above photo is (the knitted object; the button is quite obviously a button) you may just win a prize. I’m not sure what that prize is, yet, but I promise I’ll make it good. Ready? Go! My entrance into the Ravelympic competition got off to a bit of a late start, since I managed to seriously oversleep yesterday, but now we’re off and running. Except not actually running. That might be difficult with a spindle in my hand. I did settle on the spinning and knitting socks, after all. I almost went for a lace cardigan, but I couldn’t get gauge and 10pm the night before the games start is not a good time to be rewriting a pattern to fit the yarn. 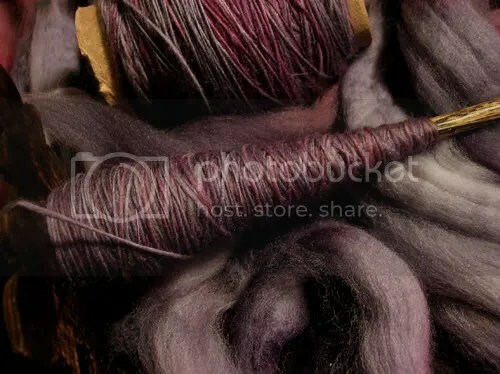 Spinning is going well; my singles are fairly even, I seriously cannot say enough good things about this fiber (handdyed rambouillet from flawful fibers), and for the moment I seem to be on track. I may be presented with a small obstacle, however. I started a sock last night in a fit of “but I have nothing to knit!” even though I do, in fact, have plenty to knit, and should really be focusing all of my crafty efforts on the spinning, in any case. But I think I can juggle both projects. Maybe. We’ll see. *edit* Silly me for forgetting. 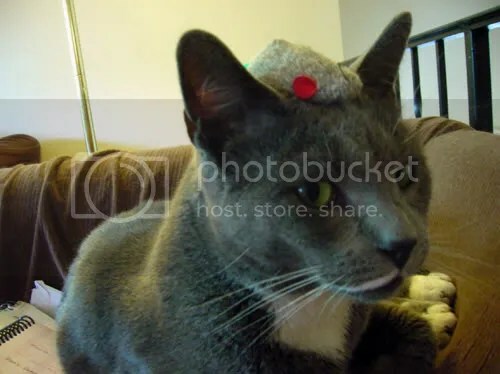 It’s Caturday! ‘raptor still won’t vacate my spinning chair. 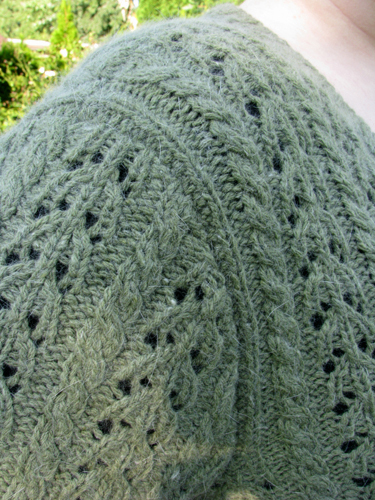 After ten hours (no I’m not kidding, ten hours) of seaming, I finished the cardigan. Problem is, since I’ve just come off this huge project, I don’t have much interest in doing another one. But there’s this game, see, that starts tomorrow—the Ravelympics, perhaps you’ve heard of it? The point of it (to me) is to commit to one huge project and do the whole thing in just over two weeks. And now I don’t know what to do. 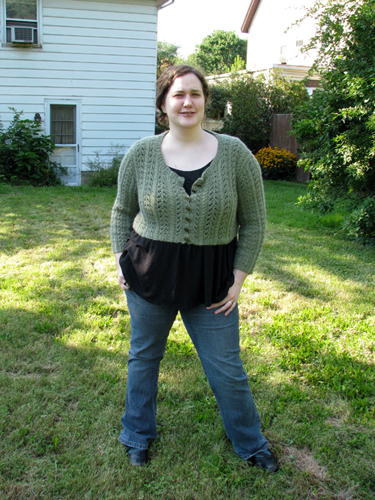 The original plan was to knit the cardigan seen above, but I got impatient and knit it early. And perhaps it wouldn’t’ve been the best challenge, because finishing it in 17 days really wasn’t that much of a challenge. I took a few days off, even. 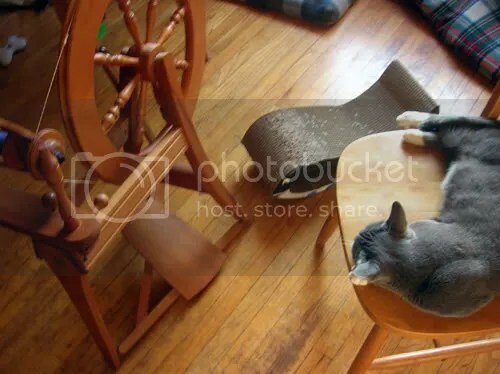 So then the plan was to spin the yarn for and knit a pair of socks. But now I’m concerned that 1) that won’t be a challenge in the slightest and 2) other than the practice stuff I have, the roving that I was planning to use is really the last bit that I have. Why should I rush through it? That seems a bit silly. And yet, I can’t find any other suitable project. And I have less than eleven hours to find one. 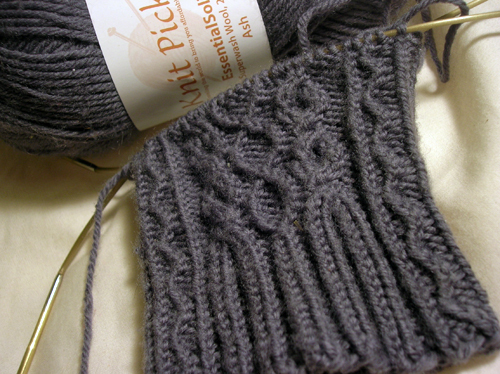 Possibly, the problem is that I knit too fast. A sweater? Just finished one in 17 days. 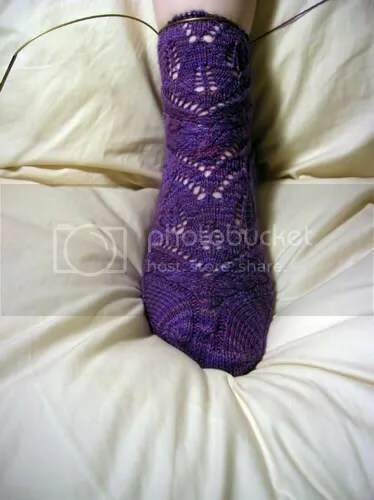 Design and knit a pair of socks? Did that in a week, last time. 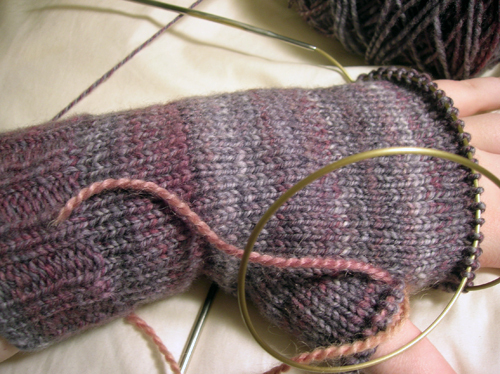 So I think the proper solution may be a series of smaller projects—perhaps several pairs of socks? Or some socks and some mittens. Or several pairs of mittens. You can see where the challenge comes in. Maybe my event should be project picking, since that seems to be plenty complicated for me. In between the near-constant sweater knitting I’ve been fooling around a bit, trying to put together a plan for the Ravelympics. A lot of what I’m going to do will depend on time; whether to go top down or toe up on the socks, whether to knit plain or patterned. But I figured it might be a good idea to get something basic out of the way first. How many plies. There are pros and cons to each, obviously. 3-ply is nice and round and smooshy, will provide more yardage than a cabled 4-ply, and spins up faster. 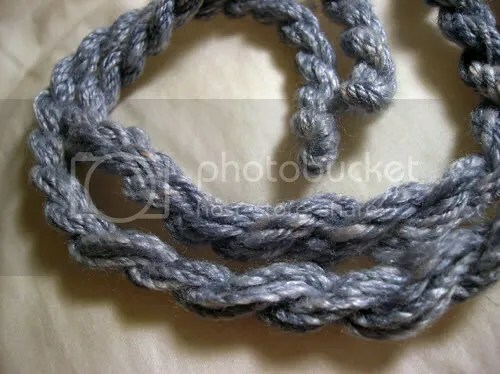 But, at least in sampling, my 4-ply was much more even, and in doing a 4-ply, the ends can be andean or handy plied so that there’s no waste left over. 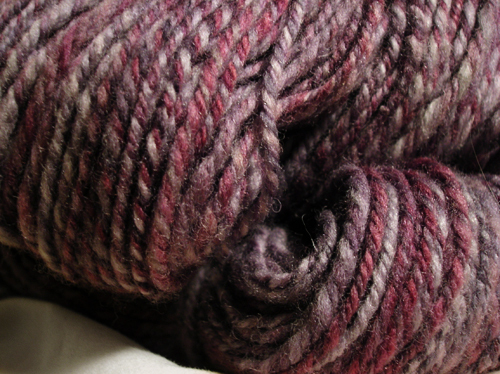 A cabled 4-ply is also sturdier than 3-ply, although it is a bit thicker than I normally like for sock yarn.